Disabled individuals face various challenges when it comes to public transportation. What would be a quick trip to the grocery store for the average individual can become a several-hour journey. From coordinating rides and waiting to be picked up, to accessing buildings and negotiating crowds, it’s tough to get around for many who are in wheelchairs. Even getting to doctor visits and clinics can be a constant burden. Fortunately, most buses and other public transportation provides wheelchair or handicapped access, and some private organizations are able are able to do pick ups and drop offs. Van Products mobility vans makes it easy and convenient to bring freedom to you and your family. With two locations in Wilmington and Raleigh, our goal is help physically challenged residents in North Carolina. Van Products has a variety of both commercial and personal lifts, wheelchair accessible vehicles, hand controls, ramps and many other accessibility-oriented products. Additionally, we have a rental service called Wheelchair Getaways, where you can rent vans by the day, week, month, or longer. We also have convenient delivery and pick up for when you’re done! Service is our priority, so when we can, we come to you. The scooter and wheelchair accessible vans are perfect for medical visits, special occasions, going to sporting events, or for a weekend getaway! 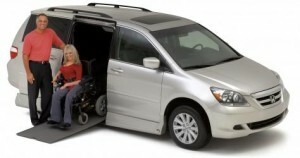 Van Products accommodates you as much as possible, offering easy-to-use hand controls, wheelchair tie downs, automotive style seating, stair lifts, wheelchair platform lifts, and scooter lifts. Let us know how we can help you – we’d love to get things rolling. Drop us a note!